It’s that time of year when the inter-county scene fades into the background and club championships, along with other GAA events, take centre stage. 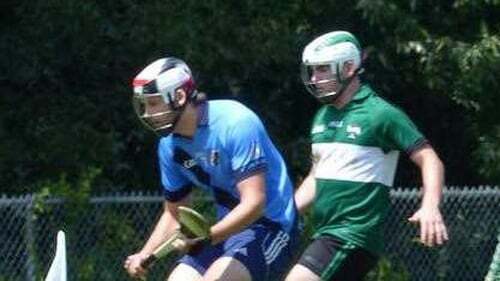 One of the less high-profile games that takes place in the off-season, and looks set to be a regular event in the Gaelic games calendar is the Fenway Classic. While the 11-aside hurling game played at the home of the Boston Red Sox hasn’t captured the imaginations of the people here in Ireland, for Michael Walsh (20) it’s a big deal. The young hurler is currently a student in UCD but was born and raised in America and today, during the Fenway Classic, a video about his hurling team will be shown to those in attendance. The story of the Providence Hurling Club is a special one. It began in 2014 when Walsh travelled to Ireland for a family holiday. He visited Ennis in county Clare and stumbled upon an under-21 hurling match between Cork and Clare. He was captivated and fell totally in love with the game. While still on his holidays, the then-16-year-old got his hands on a hurley and brought it home to Rhode Island. He started practising and once he got the hang of the basics went in search of his nearest club. There were teams in Worcester, Hartford and Boston, but none in his city so he decided to set-up his own. He recruited his friends to play with him and then a chance meeting with a neighbour, Michael Kennelly, speeded up the process and Providence hurling club was formed. From there, they spread the word about the sport and the club by setting up social media accounts and partaking in the local St Patrick’s Day parade. Within a few weeks they had enough players to have some solid training sessions and play games against teams in the North east of America. "There’s a wide variety of players," Walsh told RTÉ Sport. "In age, we range from 18 to 52 and it’s not only Irish guys too, it’s Americans, we have a Dominican guy on our team, we have different faiths. We don’t mind who plays, we just want to spread the game." Providence train in an elementary school in the city, initially using soccer goals with PVC pipes attached before investing in a proper set of GAA posts. Walsh is now studying in UCD. he played on the Fresher’s team last year and this year he is involved in coaching the Freshers. He is gaining experience as a player and a coach that he hopes will be beneficial when he eventually returns home. "We are always looking for new players. For now the only thing we can ask for is to generate interest and show people what hurling is about, spread the Irish traditions and culture. "Then hopefully we can build a Camogie club and youth programmes." Walsh has big plans for his club, this is only the beginning.